Lafayette Studio is dedicated to creating a harmonious and pleasant place for artists to teach, learn and work. We serve as a space for professional artists to teach independently, for art students to expand their knowledge and abilities at their own pace, and a place for working artists at all levels to work and build a lasting community. The pursuit of art is both personal and communal; our classes provide a solid foundation for people just at the beginning of their art sojourn, and a continuing support system as art student develops into artist. Art skills and techniques are emphasized, with the deep understanding that the goal of acquiring these skills is to nourish individual style and taste. Our space is available to rent as a central location for private artist groups, art instructors and art workshops. Lafayette Studio is a fully stocked fine art studio for painting and drawing instruction and practice, complete with lighting, easels, tables, model stand, cleaning station, coffee/bottled water. For artists who want a studio environment away from home, Lafayette Studio is easy to reach and enjoyable to work in any time of the day or night. How do I register for winter course with Patsy Taylor (drawing)? Patsy’s email and phone should be listed with each class on the website. I am just now setting up the winter schedule and hope to have it online by the end of today. just wanted to ask how much you charge for renting a space to teach a small art class. Lafayette Studio charges $27.50 an hour for using the space to teach a class. This includes 30 minutes on either side of the designated class time for setup and cleanup, which is not charged but belongs to that teacher. The typical class is scheduled for 3 hours = $82.50 x 8 classes (a typical number of sessions per quarter) = $660.00 for the quarter. 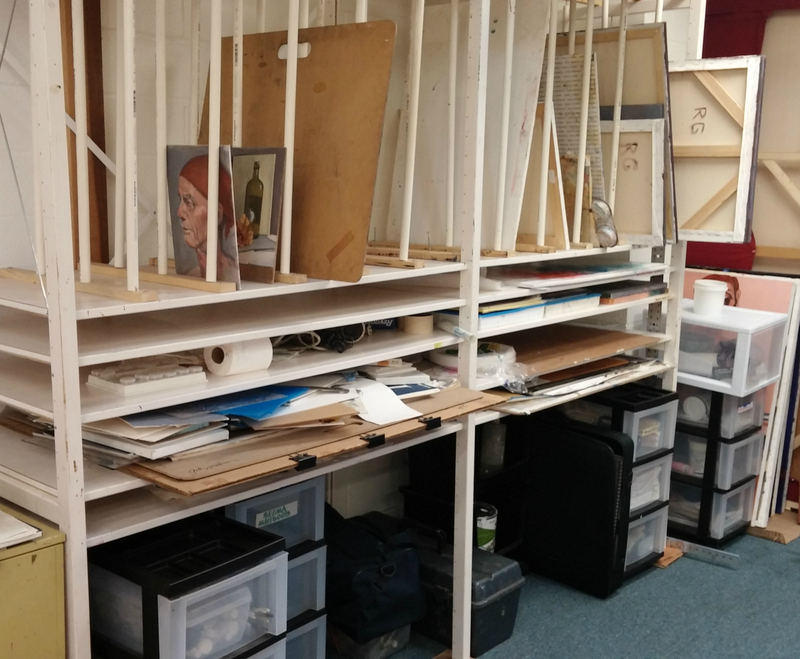 Each instructor is given a small rolling cart in which to store art materials, plus a (roughly) 36′ x 48″ shelf for larger (mostly flat) items. Thank you for your inquiry, and Happy New Year! Our Class Schedule is now online! Located at 1136 K Saranap Avenue, Walnut Creek, our studio is in the unincorporated area between Walnut Creek and Lafayette, right off Boulevard Way. You can find the map through our About tab on the far right. For many classes you can join anytime, just contact the instructor. Sign up for notice of upcoming classes and events!